Happy Friday friends! I'm excited to be sharing the second part of my collaboration with LIT Boutique today. If you read last Friday's post, then you know that LIT Boutique is one of my favorite local stores. With lines like Blank NYC, Keepsake, Black Orchid, and Quay, I can never step into the store and leave empty handed. A couple of week ago, I had the opportunity to check out LIT's fall collection, and shoot a few looks showcasing some of this season's top trends. Last week, I showed you a monochromatic look, and today I'm sharing three more fall must haves, which are suede, fur, and velvet. The first look shows how you can easily change up a outfit by layering outerwear. We took an all black look, and styled it both with a faux fur vest and a suede jacket. The faux fur added a touch of glam, while the suede jacket gave it an edgy feel. I also have to talk about these jeans because they're amazing! You can't see the detail in these photos, but they're a high rise, with a double button closure. Not only are they super comfortable, but the double button adds a fun touch, making them perfect for tucking in a top, or paring with a cropped sweater. The second look mixes two of this season trends in one. Velvet and Marigold. Velvet is huge this season, and Marigold is the must have color. I never thought I could pull off the yellow-orange hue, but when my store stylist insisted that I try it on, I become obsessed. Not only is the color prefect for the fall, but I love the ruffle detail. Because the top has a 70's feel, we paired it with petite sunglasses and fringe earrings, giving a fun retro vibe. What's been your favorite trend to wear this fall? The feature blogger is Meagan of Meagan's Moda. Is this not a perfect fall look? I want to wrap myself up in that cardigan. Make sure to stop by her blog to see some great maternity style, and say hello! The marigold top is just gorgeous on you! I love he rich velvet. The all black look is great too and it suites you! These are incredible looks! Dying over that jacket. Thanks so much for the link up! Rachael, you look freaking amazing in all of these looks! Super edgy...right up my alley! And crazy sassy! I love it all! Have a fabulous weekend, my friend. These are definitely all the trends this fall! I never saw this marigold color till recently, now I'm seeing it everywhere! I just bought a marigold chenille cardigan and can't wait to wear it! I wish I could go to this boutique! I am seriously loving every single thing you've sharing from there. ON. POINT. I just love that moto jacket and those booties give me all the serious heart eyes too! Happy weekend! What a great collaboration! I was obsessed with the look last week and totally saw myself I something like it. This week you are showcasing the velvet trend which is a bit out of my norm but I have been tempted to try on a couple of swing dress in velvet so see how I feel in it. Love the marigold color on you, so vibrant. Love, love, love!! Beautiful pieces! How amazing is that ruffled, gold top? You are so stylish! Love both of the looks! That velvet top is SOOOOO amazing!! Love! Rach, love both looks on you. I dig the monochromatic look but that velvet top = GORGEOUS!! 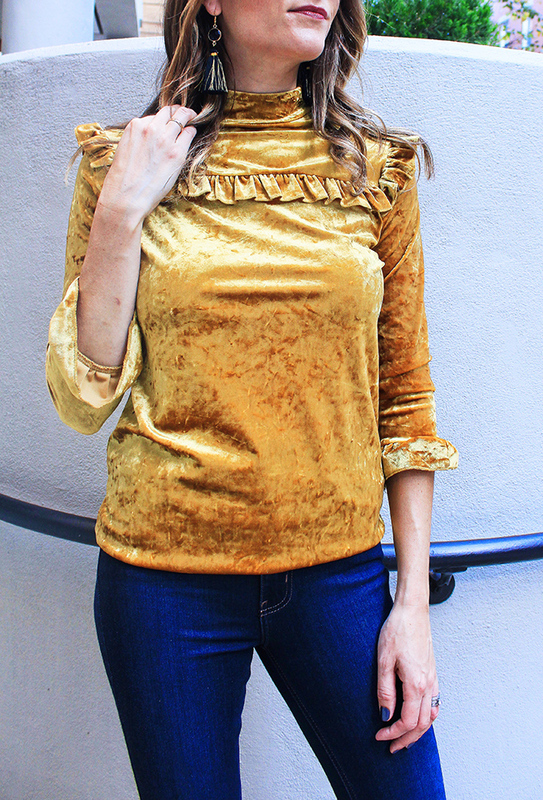 That velvet top in marigold is a keeper. I wish we had this store here, it is the perfect trendy fall top! 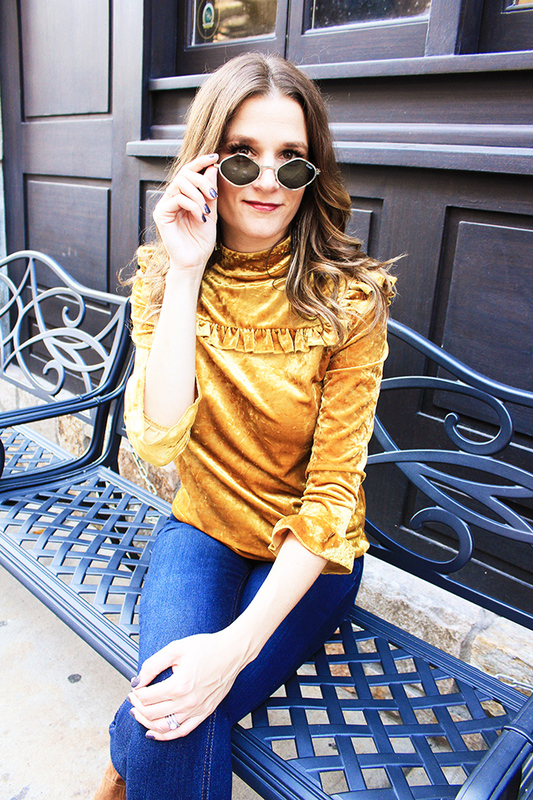 love love that velvet yellow top!! Loving that mustard velvet on you! so pretty. I just adore the marigold colored top! I own a few pieces in this color and love how it pops! Also, velvet is a trend fave of mine too! Loving all these fall picks! That suede jacket is amazing! Okay I love that mustardy colored top. It's gorgeous and velvet is always on my must have list. You look gorgeous in both looks! 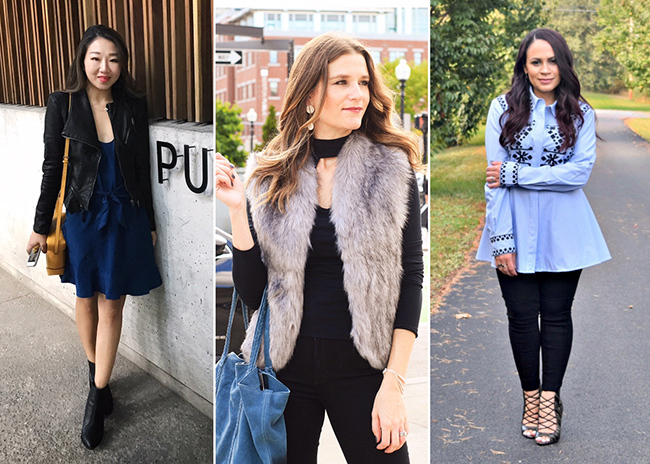 You're seriously wearing all of my fave fall trends- choker tops, fur vests, velvet, and suede moto jackets! Love all of your looks! i am loving all of these fall trends especially the fur vest! love it! I am in love with the mustard yellow top on you and the fact that it's mustard is just an added bonus because it looks so luxe! Totally love the style of all the ladies you've chosen to share this week and esp. love Sheree from Posh Classy Mom! I am loving that leather jacket and that pretty mustard ruffle top! SO cute! I really love that yellow velvet top on you! Gorgeous pieces here! You've got some great looks going on here. The colors and textures are truly to die for! That marigold velvet top looks amazing with the jeans and booties! I love the faux fur vest too! That marigold top is stunning! I am so happy she had you try it on. Basically everything in this post is perfect. I am loving these outfits! That velvet top is so cute! Wow! I love the layered look of your first outfit. A jacket like this is so essential for fall. This boutique seems to have such cute picks. I will definitely need to check them out. So many goodies in this post! Love that moto jacket & the color of that ruffle top is perfect for fall. Loving these looks—so many great textures! That suede moto jacket is to die for. Love all these fall looks - especially the vest! I am loving vests this year, I love your vest and that black jacket!